The trailer shows air strikes on the British homeland, combat around the capital and demonstrates how players can follow the war on the map through descriptive arrows and animation. 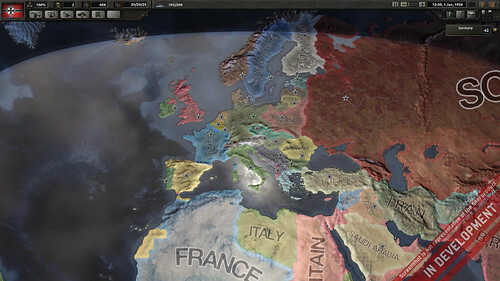 In Hearts of Iron IV, like all Paradox grand strategy games, history changes the moment you start your game. Hearts of Iron IV will be your chance to revisit the last titanic military struggle between the world’s greatest powers. You have complete control over a nation’s industry, military doctrine, political goals and strategic planning. Assign your fleets and air wings to areas of operation, draft your invasion plans and keep your war economy running by protecting your convoys. Click on the headline to watch the trailer. Looks promising. Probably more complex than I can understand.